Well, Samus (again, my Compaq Presario laptop running Linux) is at a state where it’s pretty stable and running smoothly. It took a couple of days, but it’s at a point now where it’s usable and not slow as hell like it was before. I had mentioned putting IceWM on it before, but once I finally got it installed, I realized it was TOO minimalistic for my tastes. 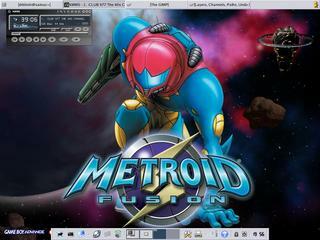 So having given that one up, I decided to do some research to find a different, more appropriate desktop environment. I finally found that a desktop environment called Xfce was available as part of Fedora Core 4, but the reason I had missed it when installing it was because it had been moved to the “extras” part of the distribution. So, I installed it, tried it… configured it to my tastes, and now I’m good to go. Granted, it took a little searching to find how to get one thing set up correctly (namely, switching my default terminal from xterm to something like gnome-terminal), but otherwise, it’s been far less painful than I would have expected. It definitely runs a lot lighter than GNOME did, and frankly, I’m happy now. I’ve also done a bit of checking to find out the status of Nova (my Powerbook). Apparently there must have been something wrong with the hardware as I suspected, as the current status shows it at the repair depot waiting on a part. Oh, well… the main thing I’m concerned about is whether it’ll come back with the hard drive wiped or not. If it does, it’s not that big of a concern… as I’ve said before, it provides me with an excuse to upgrade it up to Tiger. I also hope to have it back soon as I’m going to need access to iMovie soon for a project that I’ll need to work on. Finally, I’m pondering acquiring a 19″ LCD monitor my friend Shinnokxz pointed out to me on Newegg. I’m seriously tempted, as he got one and says it’s “ORGASMIC”. At $300, it’s a hefty chunk out of my wallet, but considering the current 19″ CRT monitor I have is a serious power drain, it might be worth it. Besides which, Dad will probably take the old monitor if I ask him. We’ll see. Anyway, back to the grind here. Fun fun…. That picture is so so so so so so cool!!!!! I mean I’ve played all the games and I’ve never seen anything like this!!!!!!!!!! !